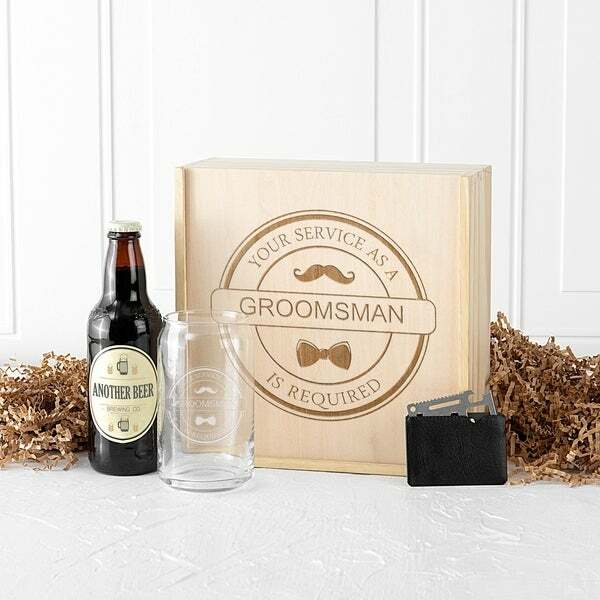 Give your groomsmen the best with the Craft Beer Gift Box. The handsomely designed gift box is crafted from pine wood. The box includes a craft beer glass, a multi tool, and is large enough to fit a bottle. Available as shown only. Set Includes: one pine wood box, one craft beer glass, one multi tool Dimensions: L: Box: 9.5" W: Box: 9.5" H: Box: 4" Features: pine wood box, printed design, removable wooden top Materials: Pine wood box Care Instructions: Printed surface is protectively coated to withstand the stress of daily use but is not designed for excessive scratching, rubbing, or contact with abrasive surfaces. Engraving Options: Available as shown only. Factory sealed packages cannot be returned if opened. Best Budget Honeymoon Ideas from Overstock.com. Here's how to have a great honeymoon without spending a lot of money. Best Wedding Gift Ideas for an Older Couple from Overstock.com. Our guides provide customers with the best wedding gift ideas for an older couple. Wedding Budget Guide from Overstock.com. A comprehensive list of common wedding expenses and a guide to the typical costs. Top 10 Gifts for the Best Man from Overstock.com. Our guides provide customers with information about wedding gifts.